City Council Member Joe Borelli, one of three Republicans in the 51-seat City Council, on Tuesday called for a hearing on voter fraud and said that he supports a statewide voter identification law to combat potential fraud. Borelli’s calls came after the release of a secretly-recorded video that showed a Democratic Commissioner for the city Board of Elections claiming significant voting fraud and criticizing the city’s municipal identification program for contributing to it. Borelli, who sits on the Council’s governmental operations committee, which has oversight of the Board of Elections, wrote to committee chair Ben Kallos, a Democrat from Manhattan, requesting the hearing. Kallos told Gotham Gazette on Thursday that he disagrees with Borelli about the need for a state voter identification law and said that he will bring up the fraud allegations by BOE Commissioner Alan Schulkin at an already-planned elections oversight hearing in October. Schulkin’s comments and the call for a voter identification law also prompted strong rebukes from the offices of Mayor Bill de Blasio and City Council Speaker Melissa Mark-Viverito. The video in question, first reported by the New York Post, is the work of Project Veritas, a conservative group that purports to investigate corruption in public institutions through hidden camera exposes. The group’s founder, James O’Keefe, has a checkered history of using ‘gotcha’ tactics and manipulated videos to pursue his agenda. In the video, shot by a Project Veritas member at a holiday party hosted by the United Federation of Teachers in December, Schulkin, the Democratic election commissioner from Manhattan, said, “I think there is a lot of voter fraud” and claimed, falsely, that the city gives away its municipal identification card without any prerequisites. 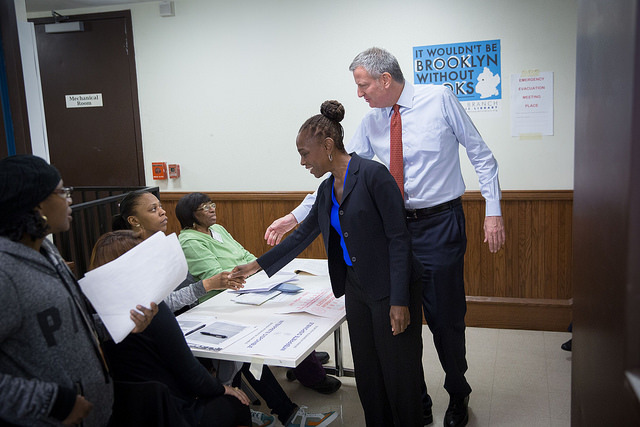 There is also no relationship between the municipal ID and voting in New York. The New York City Board of Elections is composed of a Democratic and Republican commissioner from each of the five boroughs. In the video, Schulkin suggested that IDNYC, the municipal ID card that is a signature accomplishment for both de Blasio and Mark-Viverito, can be used fraudulently, even to cast a vote, and that the law should establish a form of identification for voters. “You know, I don’t think it’s too much to ask somebody to show some kind of an ID,” Schulkin said. Schulkin clarified his remarks to the Post on Monday but did not entirely recant his words. “I should have said ‘potential fraud’ instead of ‘fraud,’” he said. The de Blasio administration and other local elected officials didn’t take kindly to the unsubstantiated claims made by Schulkin or the calls for voter identification. Another spokesperson pointed out that the municipal ID program has built-in fraud prevention measures and involves layers of screening and authentication. According to the latest quarterly report from September, the program detected 92 instances of suspected fraud and prevented those applications from going through, out of more than 996,000 applications. In another 18 cases, an applicant may have applied with a different name and in a single case, the application documents could not be verified. During a phone interview Thursday evening, Borelli said, “I want to remind the administration that this is a Democratic commissioner, and to my knowledge no Republican commissioner has made a claim of voter fraud.” “I’m not sure why there’s a hint of protectionism over what this person is saying,” Borelli added, noting that "any other allegation of fraud from a commissioner anywhere would be investigated." “How often is it you have an agency head saying there is fraud in their own agency and you have people trying to sweep it under the rug?” Borelli asked, rhetorically. Any claim that the IDNYC can be used for voter fraud is dubious, since New York State requires no identification to vote except a signature -- something Borelli acknowledged Thursday, saying he is focused on the allegations of voter fraud. Voter identification laws, meanwhile, are almost always controversial and have been the subject of a number of legal battles across the country, particularly in Republican-led states. Those on the left say that there is scant evidence of voter fraud that would necessitate such laws and that such voting requirements tend to keep people of color from voting. Kallos said he was “troubled and concerned” about Schulkin’s comments in the video and would bring the issue up at an oversight hearing already in the works before Borelli sent his letter -- the City Council holds a hearing ahead of election administration. Borelli wants to drill down on voter fraud. “To say there are no individual cases of fraud within the Board of Elections system when we have annual hearings on fraudulent petition signatures would be false,” he said Thursday. The Staten Island Council member pointed to discussions across the country about the possible need for voter identification and questioned the matching signatures approach currently used in New York, saying that he's sure there are instances where a voter's signature does not match what is in the sign-in book but the discrepancy is not reported. Kallos said the oversight hearing, which will be held by the end of October, already planned to focus on whether the Board of Elections is prepared for the presidential election on November 8. The agenda will touch upon the state voter file, whether or not voters who were incorrectly purged from the rolls before the April presidential primary had been restored, whether the BOE will have enough people to work on Election Day, and any concerns brought up by Council members, including Borelli. In an emailed statement, Council Speaker Melissa Mark-Viverito said of the video, “These uninformed opinions have no basis in fact.” Spokesperson Eric Koch said the speaker does not believe in voter identification laws. Reporting contributed by Ben Max.